The general circulation is about to explode over the western United States. Snow levels will initially be quite high during the first wave lasting from Friday to Saturday morning. The second wave is colder and will drop snow levels by 1500+ feet between Saturday evening and Sunday morning. A third wave will be colder still and allow to snow to accumulate at Boreal. Beautiful filamentary structures of concentrated midlatitude moisture. A tropospheric river in all its glory. It would not be surprising to see a foot or more of the stickiest, ickiest snow on the Summit by Monday morning with several feet coating the higher peaks. Shorter people could be buried further north. The orientation of the plume will favor the northern half of the Sierra and southern Cascades from Sonora to Shasta. 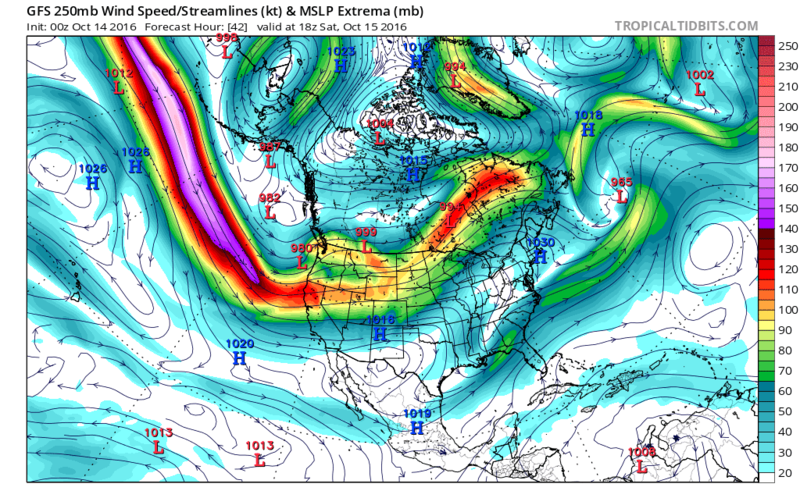 The Pacific-wide zonal flow regime is excellent for a high impact, high snow level precipitation event. Classic setup for a high elevation drenching! Winds will easily allow north shore surfing to occur. This weekend's events will be absolutely superb for several reasons. 1) as the ground becomes saturated, it will be set to freeze and cause minimal damage to vegetation after a very dry and rather hot summer, 2) the trails will be in tip top shape once they dry out after a few days (don't ride too soon! nobody likes rutted berms) and 3) streams and lakes will receive a nice boost in flow/level.